"A super simple one-pot dinner that's low calorie, low carb, paleo, gluten-free and takes just 10 minutes to make. This will be your go-to week night dinner! Serve immediately or store in the refrigerator up to 3 days." Heat olive oil in a large skillet over medium heat. Add turkey breast, green pepper, garlic, Italian seasoning, ground black pepper, salt, and red pepper flakes; cook and stir until turkey is lightly browned, 4 to 5 minutes. Stir marinara sauce and baby spinach into the turkey mixture; cook and stir until marinara sauce is warm through, about 3 minutes. 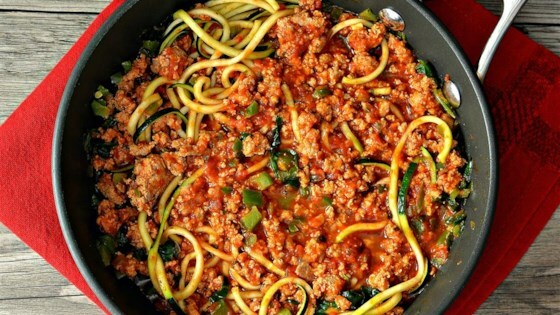 Stir zucchini noodles into the sauce with tongs; cook and stir until the zucchini is slightly tender, 2 to 3 minutes. I use an organic, no salt added, low sugar marinara sauce. To make the zucchini noodles, use a spiralizer or vegetable peeler. We used zucchini slices instead of strings and mushrooms instead of spinach but man it’s great!!! So delicious. My husband isn’t a zoo sled kind of person or anything close to pasta. He absolutely loved this recipe. I added a bit more spice and it was just perfect. Awesome dish! Used Butternut Squash and Sqush Noodles ... didn’t have zucchini handy but was still amazing!! Thanks for sharing!